The Uwajima Gaiya (or Ushioni) festival is a 3-day summer festival held in mid-July. In the evening groups will compete by parading down the shopping arcade with their own rendition of the traditional “gaiya” dance. They are accompanied by Ushioni (or “demon cows”) and other floats. 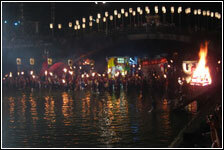 The climax of the festival is when various floats and mikoshis arrive in the rirver surrounded by torch light. The Matsuyama Summer Festival actually consists of several events spread out over the course of a month. Every Saturday through July and most of August there is a night market held in Okaido and Gintengai with festival food and games. 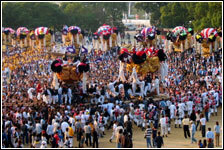 The actual festival itself is a two day event in the beginning of August and includes group parade dancing down Okaido. 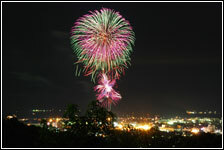 The end of the festival is signaled by a fireworks display from Mitsuhama port. The Saijo Matsuri takes place in mid October over a series of two days. It is a festival to celebrate the four shrines of Saijo City. On the first day 77 danjiri (floats) parde through the city from 2am to 6am. The following day, four mikoshi (portable shines) gather at the bank of Kamo River, with some being carried into the water at the climax of the festival. The Niihama Taiko festival is a 3 day festival that takes place in mid-October. It is tradtionally a harvest festival to celebrate the year’s good harvest. Each of the 50 neighborhoods in Niihama makes their own float, which is in turn carried by the local townspeople and paraded through the city while consuming copious amounts of alcohol. Ehime is one of the few places to enjoy the company of hotaru, or fireflies. 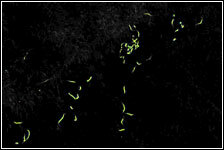 They are mostly found in the mountains where the water is crystal clear and pollution free. They appear for about two weeks during mid-June. 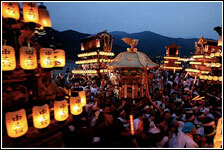 During this time, several towns will host local Hotaru festivals. Good places to see them are Ozu, Matsuno, and Hirota Village. Would like to click on photos to see more detail.